ArtPrize-goers encouraged to begin planning their visit through the updated ArtPrize mobile app and streamlined website. GRAND RAPIDS, Michigan, September 10, 2015 – ArtPrize, the radically open international art competition decided by public vote and expert jury, today launched the ArtPrize Seven mobile app, developed in partnership with Atomic Object for both iOS and Android. Combined with a streamlined and newly updated website, the ArtPrize suite of technology-based audience engagement tools will deliver a seamless user experience, with the voting module as its centerpiece. 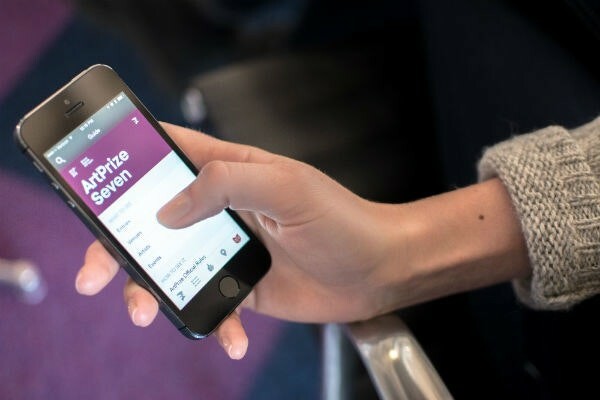 The ArtPrize Seven mobile app is now available for download via the Apple and Google Play stores, allowing visitors to begin planning their experience for the 19-day event. The intersection of art and technology is central to the way that ArtPrize was founded and continues to run to this day, powering the public vote and the artist-venue connections process, as well as influencing the way that artists make and share their work. Since the close of the 2014 event, ArtPrize has worked to refine both the mobile app and website, ushering in a sleeker, leaner design and surfacing the most sought-after content, features, and functionality on both platforms. The popular List feature returns to the ArtPrize mobile app and artprize.org, allowing everyone to browse the 1,550 artist entries competing in ArtPrize Seven and create unlimited lists of the artwork that they most want to see. Lists are easily shared via social media, text message, and email, and ArtPrize-goers can browse and follow Lists that have been made available to the public. Also returning to the mobile app are the ArtPrize event and blog integrations, keeping visitors in the know about what’s happening around the event. The continuation of the interactive map feature at artprize.org and within the mobile app gives greater context to the location of venues, events, restaurants, and brewpubs that are in their vicinity. The mobile app will be continuously updated throughout the 19-day event, providing users with real-time useful information to plan their visit. And, of course, the public will cast their votes, and ultimately decide the winners of $250,000 in prizes, via the mobile app, at artprize.org, and by text message (SMS). Voters will be able to register while downtown via the mobile app, skipping the lines at designated voting sites—and then cast their votes either from within the event boundaries or wherever their day may lead them. ArtPrize Seven will take place from September 23 to October 11, 2015 when three square miles of downtown Grand Rapids, Michigan will become an open playing field where everyone can join the conversation about art, and where the public decides the winners' circle.